By applying an ecologically based approach, Dr. Wasserberg seeks to identify weak links in the life-cycle of the pathogen and target these with precision and efficacy in order to break the transmission cycle between phlebotomine sand flies and humans. She also received new funding from the University of North Carolina System Office/myFutureNC, a statewide educational commission focused on developing goals and strategic goals around educational attainment, for the project “Policy Brief – Transition from K-12 to College/College Access in North Carolina,” which focuses on the transition from high school to college. Through the project and the efforts of GCD, they will increase access to high-quality early childhood care by direct provision of high-quality early childhood services and comprehensive training to increase the knowledge and skills of child care staff and heighten the quality of care in homes and classrooms. UNC Greensboro summer camps provide unique learning experiences for young people in the Triad and beyond, with programs for kids ages 7 to 18, and even college students. Camps in art, music, science, writing, theater, a variety of sports, herpetology and more are accepting applications for Summer 2018. In this residential research-based camp, rising 9th- through 12th-graders work alongside field experts in exploring the vast ecosystem at Chestnut Ridge Camp and Retreat Center. Each morning students go into the field to catch, catalog and release various reptiles and amphibians. They will study the inhabitants of ephemeral pools, streams, lakes and hardwood forests. Possible field studies include: water turtles, box turtles, snakes, stream amphibians, ephemeral pool amphibians and frog calls. The camp is based at a nut-free facility that can provide vegetarian and gluten-free options as needed. Scholarships are available. Contact christine@campchestnutridge.org for more information, or visit the website here. Find out more about the Herp Project at UNCG and other summer programs here. The UNCG School of Music, Theatre and Dance offers the Summer Dance Intensive, a program designed for UNCG Dance majors and minors, dancers from other universities and rising high school juniors and seniors who can earn UNCG credit or attend with a non-credit option. The guest instructor for 2018 is Juel D. Lane, an innovative dancer and choreographer who performs with Camille A. Brown & Dancers, and has collaborated with a variety of dance legends. Students may register for the Technique morning session as a stand-alone credit. Dance Repertory credit requires full-day enrollment. All students must be at an intermediate or advanced level of dance training in contemporary or ballet technique. Applicants will be required to furnish links to a video sample of 3 to 5 minutes in length to demonstrate their technique. Details and registration information are available here. Ages 13-17, July 9-20: Shrek the Musical Jr.
Ages 7-17, July 23-Aug 3: Alice in Wonderland Jr. The nationally recognized North Carolina Theatre for Young People is back for its second year of the UNCG Summer Theatre Camp. Run by the professionally trained artistic team at NCTYP, the two-week summer camps will host children ages 7 to 17, in three groups according to age. The camp will run from 9:30 a.m. to 4:30 p.m. at the UNCG School of Theatre. Sessions will allow students to experience the creation of a complete theatrical production. Participants will build communication skills and theatrical abilities while having fun and making new friends. High school artists will work closely with UNCG arts faculty and staff to develop artistic skills, experiment with new techniques and develop portfolio-quality artwork in a state-of-the-art studio environment. Students choose three artistic disciplines to fill their morning, afternoon, and evening studio time. The choices include painting, photography, film-making, animation, interior architecture, graphic design, advanced drawing and more. These studio classes feature both instruction and hands-on time, allowing the students to understand and develop their skills in a supportive environment. The program also includes visits to Weatherspoon Art Museum, trips to open studios and other art enrichment activities with professional artists. The program ends with a closing reception and student art show, during which students exhibit the results of their work over the course of the camp. Day Camp includes studio instruction, art supplies, art exhibition, meals and art enrichment activities. Overnight Camp includes all of the above, as well as double occupancy housing in a UNCG dormitory. 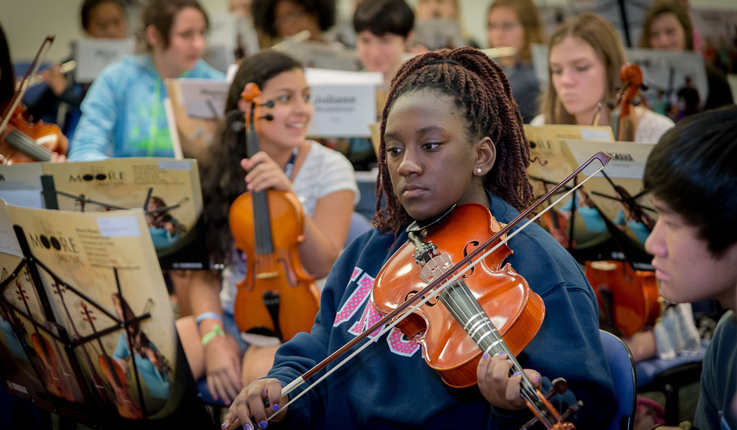 UNCG’s Summer Music Camp, the largest university music camp in America, is back for 2018. 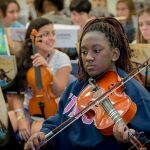 This summer, two one-week camps are being offered, serving over 2,000 musicians, with programs in band, mixed chorus, orchestra and piano. Camp participants are guided by UNCG School of Music faculty. These faculty instructors are joined by guest teachers, performers and conductors from throughout the nation who will ensure that each student receives an unmatched musical education. Ensemble performance is emphasized, but a private lesson in instrument or voice is available to all campers as well. Each camp will conclude on Friday with a concert for parents, relatives, friends and locals. Overnight students will stay in double occupancy rooms in UNCG residence halls and receive meals in the University Dining Hall. A day camper option is also available if preferred. To learn more and apply, visit smcamp.org. The Learning Factory is a one-week maker camp for elementary and middle-school students. Campers will use the makerspace to engage in a variety of engineering and artistic activities including robotics, circuitry, engineering, digital storytelling and computer science. The program builds students’ creativity, critical thinking and problem solving abilities. The camp is 8 a.m. to 12:30 p.m. every weekday and closes on Friday with a maker faire, where the students exhibit their creations. Details are available here. This two-week camp, which runs 9 a.m. to 12 p.m., introduces young writers in grades 3-12 to the writing process and to digital tools, such as storyboarding, blogging and movie-making. In daily workshops, the students work with UNCG faculty, graduate students, North Carolina teachers and local authors who support the development of a variety of writing styles. Students will also have the opportunity to participate in a special “Writing and Robotics” companion program and visit the Weatherspoon Art Museum to learn how to use visual art to inspire their writing. Typically, all student writers have the opportunity to publish their work via the camp website. Scholarships are available. See the website’s Scholarship Page or contact amvetter@uncg.edu. Visit the website for registration, to view some of the writing tools for student writers and to read the work of past participants. Writing and Robots is a companion camp for participants in the Young Writers’ Camp. In this one-week intensive, campers will use the Hummingbird Robotics kit to design and build a working robot based on the writing they did for the Young Writers’ Camp. The camp ends with a robot exhibition for family and friends. There are only 12 slots, and they’re expected to fill quickly, so sign up now if you’re interested. For more information and to register, click here. UNCG CHANCE is a five-day program that allows Latino/Hispanic high school students in the 10th or 11th grade to engage in an intensive college readiness and test prep experience. Campers will work with university professors, students and staff to develop peer/professional networks and mentorships with a focus on both academic and personal success. Participants will experience “a day in the life of a college student” through a variety of activities including attending classes, learning about financial aid, playing sports, having cultural experiences, doing team building and more. For more information, contact Kattya Castellon (336-334-5653; kjcastel@uncg.edu) or Margarita Kerkado (336-334-4090; m_kerkad@uncg.edu). Children ages 7 to 15 receive in-depth, hands-on instruction in art, science and technology. Campers may attend as day campers from 8 a.m to 9 p.m., or as residential campers, staying overnight in UNCG dormitories. During the week, each camper attends a morning class and an afternoon class. The campers are divided into two age groups (2nd through 5th grade and 6th grade and up) for all activities and classes. The class sizes are small and the curriculum encourages problem-solving and critical thinking. See the course selections here and here. In addition to hands-on learning in the arts and sciences, the campers will gain exposure to great artists and scientists whose contributions have had a significant impact on the world. The camp also includes multicultural entertainment and a focus on citizenship and daily recreation with a variety of sports and games. Note that this year, there will not be special pricing for UNCG faculty and staff. Visit allarts.uncg.edu to see details and register. “IT is for Girls” is a week-long program for middle- and high-school girls that includes hands-on technology and leadership activities. High-school students who have participated in past summer camps will be invited to serve as teen mentors for the campers in grades 6th through 8th. Past activities have included creating animations and video games, designing web pages, developing Android mobile apps, creating a video production, working with LEGO Robotics, going on field trips and more. The camp is limited to 80 qualified students. Registration opens March 6, and if registration exceeds the limit, there will be a waitlist. For more details and to register, see this page. “The Listening Lab,” auditory training and language intervention for children ages 7 to 11 diagnosed with auditory processing disorder (APD) will be offered from June 18 to 29, 9 a.m. to noon. For more information, contact Lisa Fox-Thomas at lgfoxtho@uncg.edu or call 336-256-2001. Horsepower Experience at the Therapeutic Learning Center in Colfax, North Carolina. This year the summer camp will serve school-aged children with fluency disorders. The camp will be held (exact dates TBA) June through July, 9:00 a.m. to noon. For more information contact Perry Flynn at pfflynn@uncg.edu or 336-256-2005 and see the brochure here. LIME Camp – Language Intervention through Movement and Exercise Camp at the Kaplan Center. This camp will serve rising second- and third-grade students with a language disorder. Students will participate in language therapy infused with yoga. Camp will be held (exact dates TBA) in July, 9 a.m. to 11 a.m. each day at the Kaplan Center. Space is limited. For more information or to register contact Emily Hamuka at elpraste@uncg.edu or 336-256-1105. Check for updates on the website. Though summer sports camps are not operated by the university, UNCG coaches own and operate camps in a variety of sports – and many are on campus. Information about these sports camps can be found here. 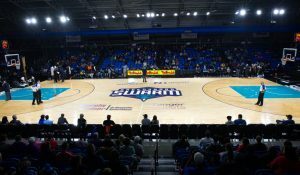 This Friday, March 16, UNC Greensboro is teaming up with the Greensboro Swarm for a special night of basketball and all things blue and gold. 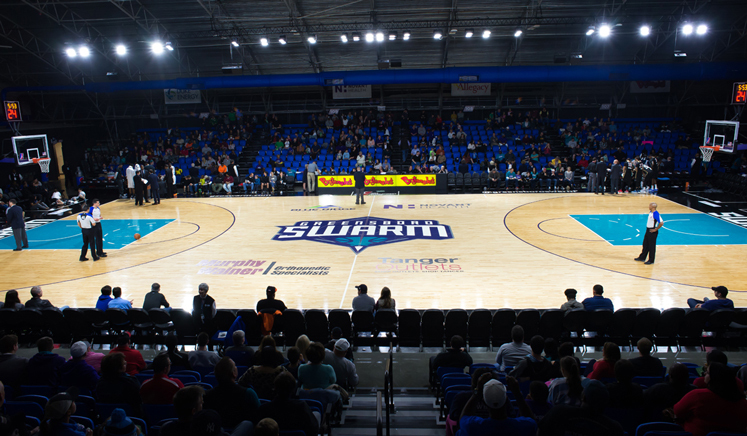 As part of “UNCG Night at the Swarm,” all UNCG students, faculty and staff are eligible for discounted tickets to see the Swarm, the NBA G League affiliate team of the Charlotte Hornets, face off against the Delaware 87ers. Tip-off is at 7 p.m. Throughout the night, UNCG will host a variety of activities for children and their families, including pre-game demonstrations with UNCG’s NanoBus and Swarm fan experiences with UNCG swag. Additionally, the UNCG Spartones a cappella group will perform before tip-off. Giveaways include “UNCG Night at the Swarm” T-shirts. Throughout the game, there will be fun contests for fans wearing their UNCG gear in the stands. UNCG students, faculty and staff can purchase discounted $7 tickets by showing their UNCG ID at the gate. Note: This post was updated March 14. For nursing students at UNC Greensboro, the labor and delivery simulation lab feels far from artificial. Students are checking vital signs, administering fluids and medication and responding to any range of complications: postpartum hemorrhage, fetal distress and preeclampsia. It’s a remarkably realistic simulation experience, made possible by the School of Nursing’s investment in state-of-the-art SimMom and SimBaby technology. In July, the school received the latest version of the SimMom, a high-tech female mannequin (accompanied by a 6-pound newborn mannequin, placenta and umbilical cord) that allows students to engage in the entire labor and delivery process. An instructor controls the robot’s responses from a laptop, and the simulations are recorded so that students and faculty can debrief together. Want to learn more? Watch the video on UNCG Now for an inside look at the labor and delivery simulation lab. The National Association of Social Workers North Carolina Chapter (NASW-NC) has named Sarah Hamrick as the recipient of the 2018 NASW-NC Presidents’ Award for Master of Social Work (MSW) graduate student for the 2017-2018 academic year. The NASW-NC Presidents’ Award honors Hamrick’s leadership ability, academic achievement, commitment to her community, and potential to impact the field of social work as a professional. Hamrick exhibited her exceptional leadership ability by establishing and presenting on writing in a graduate school setting and professional writing to incoming JMSW students at orientation. Additionally, she helps students individually with their writing so that they may succeed in their graduate program. Hamrick has served as both Vice President and Co-President of the JMSW social work student organization, where she has helped coordinate a mentoring program for first- and second-year graduate students in the program and assisted in organizing service events and guest speakers for the JMSW program. In addition to her leadership in school, Hamrick serves as a Guardian Ad Litem in Guilford County and is currently an advocate for a family of six children helping to place them in a permanent home. She has been a mentor with the UNCG Guarantee Program for the past five years, which provides scholarships and academic support to low-income, first-generation students. Hamrick also worked with Greensboro Operation Transparency, an activist group that seeks to highlight and combat injustices in the community. Academically, Hamrick has shown excellence through her engagement in research and scholarship outside of her normal coursework in the JMSW program. At the UNCG Graduate Creativity Expo in April 2017, Hamrick presented data with faculty member Dr. Maura Nsonwu centered around culturally competent social work with Latinx families in Greensboro. She also took the initiative, and is working diligently with another faculty member, to design an independent study course for the spring 2018 related to her career interest in maternal mental health. She hopes to bring competent, compassionate mental health care to new and expecting mothers and their families in underserved rural populations where there are not many resources. Hamrick’s commitment to the social work profession is evident in the passion she displays in all she is involved in and the impact she has had on her program and the community at large. Dr. Jay Poole, Interim Chair at the UNCG Department of Social Work, speaks highly of her dedication to the social work program and to the social work profession. Poole stated that Hamrick’s “commitment to being a social worker is evident” and “she exemplifies the core values of the NASW.” Poole also commented that he believes “she will become an excellent social worker and an asset to the social work profession”. Hamrick will be honored at the 2018 NASW-NC Ethics Conference and Awards Luncheon on Friday, March 23, at the Durham Convention Center. Copy courtesy NASW press release. The Alumni House will begin accepting reservations for the 2018-19 academic/fiscal year on Thursday, March 1, 2018, at 8 a.m. All requests should be made online via the Alumni House Reservation/Inquiry Request webpage at http://alumni.uncg.edu/house. For additional information, contact John Comer at 6-1466 or jfcomer@uncg.edu. In 48 hours last week, the university received 1,100 gifts and over $517,000 toward 316 different funds across campus. Spartans wore their UNCG blue and gold, attended Spartan gatherings, and spoke out on social media, where #BelieveInTheG garnered almost 2 million social impressions. Top 2 gift designations: 1. UNCG Annual Fund; and 2. Bryan School Enrichment Fund. You can still make an impact with your gift of any size to the area of the university that means most to you by visiting GiveTo.UNCG.edu. UNCG seeks to commission a permanent public artwork to celebrate and pay tribute to the thirty-year period when the university was the Woman’s College of the University of North Carolina. The tribute should resonate with the feelings of innovation, revolution, and transition associated with Woman’s College as an integral piece of UNCG’s character, history and future. The Woman’s College Tribute will be placed on part of the lawn in front of the Stone Building on College Avenue, a central location on campus and at the heart of what was Woman’s College. The only limitations on the project’s final design are that it not disturb the tree canopy and that it also respect the height and proportions of the buildings around it (Stone and Petty). Power and water can be made available to the final project. The total project budget, from the selection of the winning design, through installation is $150,000. Initial entries will be accepted on the CaFÉ website from February 6 through March 23, 2018, and all entries must be completed by midnight MST on March 23. The finalists will be notified in April, with full proposals due June 15. The selected artist will be notified in August. For more information, view the call for entry and site specifications. This Friday, UNC Greensboro, the UNCG Art Truck and Storyhound Theatre examine this question in the culmination of a three-month collaborative experiment at The Greensboro Project Space. The March 2 event is free (donations accepted), and doors open at 5:45 p.m. The Body Project is “equal parts event and artistic investigation,” according to organizers, and they will present the results of creative research of 30 artists in theatre, dance, visual arts, film, music and poetry. The group of artists, which includes UNCG students, alumni, faculty and staff, unmake and rebuild the human body through the lens of four “humors” – the basis of medicine and psychology, beginning with ancient Greeks through Shakespeare, up to the advent of modern medical research, according to Greensboro Project Space website. Each collaborator will draw on one of four humors: black bile, yellow bile, phlegm or blood. These correspond to the gallbladder, spleen, brain, liver and to four distinct temperaments that were central in the nature of many characters in literature, especially in the work of Shakespeare and other early modern writers. Want to better explain your science work and results, succinctly? All UNCG scientists, including students, are welcome to come and develop presentation skills through a workshop, Saturday, March 24, at 10 a.m. During the event, participants will learn to present their research in 180 seconds in a form that can be understood by individuals with no background knowledge on their research area. The workshop will feature numerous improv games, interactive exercises, and an analysis of their three-minute presentations. You are encouraged to bring a single PowerPoint slide with one image that best explains or represents the research done. The event is free, and will be held in Room 206 of the Joint School of Nanoscience & Nanoengineering. Campus Weekly will not publish the week of Spring Break. Campus Weekly will return to weekly publication on March 14. Have submissions for the March 14 CW? Please provide them by Thursday, March 8. If you have questions, please email mdharri3@uncg.edu. University Archivist Erin Lawrimore speaks about our university’s history in this new video. “At the very first commencement, President Charles McIver basically told the students, ‘Your job now is to go out and make a difference for the state.’ And they did.” The impact has continued, decade after decade. Tuesday, March 13, 11 a.m.
“Digital Media Commons (DMC) and Digital ACT Studio (DACTs)” by Armondo Collins, Head of Digital Media Commons and Vaughn Stewart, Director of Digital ACT Studio. Wednesday, March 14, 1:30 p.m.
Monday, April 9, 11 a.m.
“Streaming Media: From the Library and Beyond” by Samantha Harlow, Online Learning Librarian for UNCG University Libraries. Dr. Bob Gatten, 73, died on Feb. 23. He spent most of his academic career in UNC Greensboro’s Department of Biology, beginning in 1978. He received the university’s first Research Excellence Award in 1989. His research was sponsored by the National Science Foundation, the U.S. Department of Energy, and by UNCG. He supervised the research of 20 graduate and undergraduate students and was an Associate Editor of two scientific journals in his specialty. He served as head of the Department of Biology from 1988 until 1997, and as associate dean of the College of Arts and Sciences (CAS) from 1997 until 2003. While serving as associate dean, he founded UNCG’s Science Advisory Board, a group of local business leaders who provided advice about the development of the university’s science programs. One of Bob’s major responsibilities in the CAS office was helping plan new buildings (including the Sullivan Science Building) and guide the renovation of existing buildings. He retired from UNCG in late 2005 but continued to volunteer for the university in various capacities. For example, in recent years, he shared his passion for and knowledge of UNCG traditions with alumni and students. He loved history, as well as biology. For example, he developed a passionate interest in the history of the Lewis and Clark Expedition of 1803-1806, and was an active member of the Lewis and Clark Trail Heritage Foundation. Bob devoted much effort to locating the land where William Clark was born in Virginia; his work led to the creation of two Virginia Historical Highway Markers honoring Clark and his family. Information courtesy obituary in News and Record. UNC Greensboro will host a symposium featuring keynote speakers, poets and performers. “Celebrating God’s Trombones: African American Cadences and Culture” acknowledges the 90th anniversary publication of James Weldon Johnson’s beloved work. All events are free and open to the public. When the noted author and NAACP activist James Weldon Johnson sat down to write “The Creation” and “Go Down, Death,” some of the first poems of “God’s Trombones,” he sought to acknowledge the poetry of African American folk sermons: the “rhythmic dance” of the preacher’s strides, the “wonderful voice” “not of an organ or a trumpet, but rather of a trombone, the instrument possessing above all others the power to express the wide and varied range of emotions encompassed by the human voice—and with greater amplitude.” His project in writing “God’s Trombones” was to invite a broader culture of listeners into the world of the African American preacher and his congregants. The sermons have captivated the attention of generations, and they continue to be performed in a loving expression of Johnson’s vision for the acknowledgment of African American folk culture in the American nation. 5 p.m., Music Recital Hall, Rm. 100, School of Music and Performing Arts, 100 McIver St.
7:30 p.m., Music Recital Hall, Room 100, School of Music and Performing Arts, 100 McIver St.
All events are sponsored by the Class of 1952 Alumni Fund; Department of English, with support from the Honors College; African American and African Diaspora Studies; the Department of History; Religious Studies; Women’s and Gender Studies; Languages, Literatures, and Cultures; the Humanities Network Consortium; and the Dean of the College of Arts and Sciences. University Libraries presents its Spring 2018 Diversity Lecture featuring Randall Burkett, Curator of African American Collections at Rose Library, Emory University. The lecture, “Books, Boxes and Bangles: Building Research Collections in African American History and Culture,” will be held on March 15, from 10 to 11 a.m. in the Hodges Reading Room of Jackson Library on the second floor. The event is free and open to the public. Refreshments will be served. Burkett started collecting books to support his research on Marcus Garvey and on African American religious history. Over the years his collection expanded to include books, pamphlets, prints, newspapers and ephemera related to African American life and culture. He has exhibited selections from his personal collection at Harvard University’s Widener Library, the Grolier Club in New York City and elsewhere. Since 1997, Burkett has been responsible for building Emory University’s collection of African American rare books, manuscripts, photographs and print ephemera, and he has raised nearly three-quarters of a million dollars to endow acquisition and fellowship funds for the Stuart A. Rose Manuscript, Archives and Rare Book Library. For disability accommodations, please contact Jennifer Hohn at jlhohn@uncg.edu. 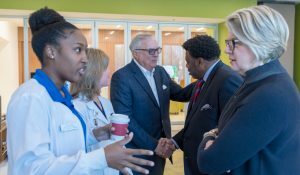 The discussion will begin at 7 p.m. with a reception starting at 6:30 p.m.
UNC Board of Governors members and UNC System President Margaret Spellings visited UNCG Tuesday morning. The morning began with Chancellor Gilliam and President Spellings signing Performance Agreements that further align the goals and strategies of UNCG and the UNC System around key priorities and metrics. After a welcome reception by Chancellor Gilliam, the board explored the Union Square campus where they learned more about the UNCG School of Nursing. They saw two interactive simulations while touring the building with Dean Robin Remsburg, members of the faculty and a number of nursing students. They then toured the sites of the two UNCG Millennial Campuses, including the site of the soon-to-be-constructed Nursing and Instructional Building. UNCG students also met with BOG members and President Spellings for round-table discussions centered upon “UNCG’s Tenacious Focus on Student Success.” Students discussed their experiences with various UNCG programs that have prepared them for collegiate success, with university retention initiatives, and with experiential learning abroad and at home. Before departing, BOG members and President Spellings were treated to a brief College of Visual and Performing Arts performance, and enjoyed a University Archives UNCG 125th pop-up exhibit. “Golden” denotes excellence and rarity, and “chain” signifies linkage – a binding together of past generations of students who served the University with students of today and those generations yet to come. The organization is unique to the UNC Greensboro campus. Members embody the characteristics of: leadership, scholarship, service, tolerance, judgement, magnanimity, and character. Golden Chain is now accepting applications for Spring 2018 inductions. Candidates must be juniors or seniors with a minimum 3.25 GPA. The nomination form and instructions can be found at https://sa.uncg.edu/golden-chain-honor-society/ and should be returned to Coretta Walker at coretta.walker@uncg.edu by March 22, 2018. Nominations may be submitted by faculty, staff, Golden Chain alumni, and honorary members. (Please note that accepted students must pay a $20 induction fee). Attend a spring break week workshop, hosted by Staff Senate Personal and Professional Development. Find your “SPARCK.” Identify your talents and gift. Create your meaningful work statement. Develop strategies to engage in your meaningful work in different content areas. This workshop will empower you to take control of your life. It will be led by Bill Johnson, Dream Dean, UNCG School of HHS. He is student Success Navigator and Life Design Catalyst Coach. It will be held Wednesday, March 7, Stone 219 – Edwards Lounge, 8:30 am – 4:30 pm. Space is limited. Lunch and snacks are provided. Registration is required. Feb. 21 and 22 (today and tomorrow) mark the fifth annual Believe in the G – a 48-hour celebration of Spartan pride for the entire campus community and beyond. Alumni, students, faculty and staff are encouraged to wear blue and gold, share their UNC Greensboro stories on social media using the hashtag #BelieveintheG, and make a gift to the university. Spartans also can can upload a themed Facebook frame to their profile pictures or use a special Snapchat filter Wednesday and Thursday around Elliott University Center and Moran Commons. According to Doebler, the university hopes to receive gifts from 1,000 Spartans. In addition, this year’s celebration includes events across the country. On Thursday, Feb. 22, alumni gatherings will take place in Charlotte, Raleigh, Atlanta, New York City and Washington, D.C. Back on campus, alumni and students are invited to the Spartans Connect Alumni + Student Networking Night. To cap off the week, alumni, faculty, staff, parents of students and friends of the university will show off their school spirit at the Spartan Spot event – complete with food and giveaways – at the men’s basketball game on Friday, Feb. 23. To learn more about this special celebration, make a gift and register for events, visit believeintheg.com. The UNCG Symphony Orchestra and University Chorale and Chamber Singers will have a performance Feb. 25 at 3:30 p.m. in UNCG Auditorium. The performance is free and open to the public. The concert will include popular works such as “blue cathedral” by Pulitzer Prize-winning composer Jennifer Higdon and “A German Requiem, to Words of the Holy Scriptures, Op. 45 (German: Ein deutsches Requiem, nach Worten der heiligen Schrift)” by German composer Johannes Brahms. Dr. Kevin Geraldi, associate professor of conducting, and Dr. Ott, associate director of choral activities, are conductors for the concert. About half of the School of Music will be present for the concert with an 85-member orchestra and 130 singers. UNCG will host Fit Expo 2018 – a national conference for young fitness professionals – this weekend at the Leonard J. Kaplan Center for Wellness on campus. More than 600 fitness instructors from across the country will arrive in Greensboro on Friday for the three-day event, which includes student presentations, classes with master trainers, breakout sessions and a keynote presentation by Jericho McMatthews, a Beachbody Live Super Trainer and co-creator of Core De Force. Two fitness classes are open to the public: Beachbody Live on Friday at 7 p.m., and Core de Force Live on Saturday at 6 p.m. Friday’s class is offered free to the public, and Saturday’s bonus session is $10 at the door. Want to learn more? Visit fitexpo2018.com. For more information about UNCG’s Department of Recreation and Wellness, visit recwell.uncg.edu. 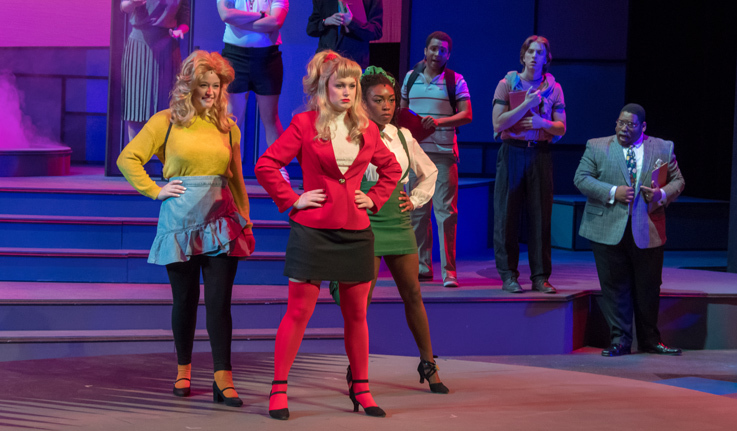 UNCG Theatre’s production of “Heathers” opened this past weekend and runs through Feb. 24 in Taylor Theatre. The show is directed by graduate student Victoria Hirsch as her master’s thesis production. The play is an unusual genre for UNCG Theatre, and for Hirsch: the dark satire comedy based on a 1980s movie with a small cult following. The story is that of high schooler Veronica Sawyer, who takes on “the Heathers,” the school’s most elite and socially cruel clique. She woos them with forgery talents and rises to notoriety through her friendship with the Heathers. What follows is a darkly comedic satire that includes violence and death, but also a sincere message. In the end, Veronica condemns and subverts violence, as well as her school’s stiff social hierarchy. “Over the course of the show, she’s presented with every method of coping: complicity by trying to stay invisible, participation by becoming part of the ruling class of the school, and opposition through anarchy/vigilante justice,” Hirsch explained. This production contains strong language as well as situations that some viewers may find uncomfortable. You may purchase tickets online here, at the box office, M-F 1-5 p.m. (336-334-4392), or by visiting the ticket window in the Brown Building. Tickets are also available by calling Triad Stage’s box office at 336-272-0160 or visiting the Triad Stage box office. Julia Loreth (Lecturer, Biology), Bob Muir (Professor Emeritus, Physics) and Jerry Walsh (Professor and Associate Department Head, Chemistry & Biochemistry) served as regional co-directors for the Greensboro Regional Science Olympiad. Science Olympiad is a national organization that supports elementary, middle and high school science competition events across the country. The North Carolina Science Olympiad, centered at NC State University, organizes 15 regional competitions across the state, one of which is at UNCG. The program brings to our campus very strong science and technology students from regional schools. Five UNCG alumni were recognized at the Triad Business Journal’s 15th-annual 40 Under Forty event, honoring young leaders across the Triad, held at UNC Greensboro’s Elliott University Center on Thursday, Feb. 15. Sponsored by the Bryan School of Business and Economics, the annual event honors the top movers and shakers – under the age of 40 – from across the Triad. The 2018 honorees represent a variety of industries. The February Faculty Forum will feature two initiatives from the Faculty Senate Committees focused on constitutional review and faculty welfare. The Faculty Senate is engaged in a two-year multi-phase process to review the Constitution of the General Faculty. The first phase has begun with the Faculty Government Committee and will be presented for discussion. The Faculty Compensation and Welfare Committee is developing a UNCG Faculty Morale Survey, last conducted in 2014, and will be seeking faculty feedback. Dr. Norman Wirzba will give a talk titled “The Difference Agrarianism Makes: Encountering The World As Gift” on March 1, as part of the Ashby Dialogue Series, “The Universe Story and the University: Education for Justice and Sacred Earth,” sponsored by the College of Arts and Sciences. It will begin at 3:30 p.m. in the School of Education Building, Room 120. The talk is open to the public. Wirzba is Professor of Theology, Ecology, and Agrarian Studies and Senior Fellow at the Kenan Institute for Ethics at Duke Divinity School. The talk will be facilitated by Dr. David McDuffie from the UNCG Department of Religious Studies. Last fall, the Provost and the Office of Research and Engagement announced the release of funding for Giant Steps Research Development Grants. The goal of this program is to provide seed funding for projects that enhance UNCG’s external visibility, encourage research and have the potential to leverage preliminary results to obtain significant future funding. A requirement of the award is the submission of at least one research proposal to an external funding source by the end of the award period. Cari Culp, registered dietitian, has several nutrition consultation appointments open. These consultations take place on campus for your convenience. As long as you have BCBS insurance, there will be no cost to you. Use this link to sign up before they are gone. HealthyUNCG, in conjunction with University Libraries, is offering a workshop for finding trustworthy health information. This workshop will be held on Tuesday, March 6, from 11 a.m. to 11:30 a.m. in the lower level of Jackson Library in the Ottoman Empire. Snacks provided. Register here. Our registered dietitian, Cari Culp, is offering a nutrition workshop on March 9 from 1 p.m. to 2 p.m. in the Bryan School, Room 113. The workshop will focus on how to avoid processed, convenience food and incorporate healthy choices into a busy lifestyle! You can register here. 4. Employee Field Day registration is now open. 5. ActiveU Classes are still being offered at Kaplan. Learn more. 6. School of Health and Human Sciences Health and Wellness Expo is March 22 in the Cone Ballroom, 11:30 a.m. to 1:30 p.m.
7. The Fitness Lending Library is still in action. Click here for resources to help you reach your 2018 goals. 8. Are you a follower? Follow HeathyUNCG on Facebook and Instagram! Each Wednesday, they will be posting a Wellness Wednesday video. These videos may include stretches, desk exercises, healthy recipes, resources on campus and more. For any questions or concerns, contact HeathyUNCG at healthy_uncg@uncg.edu or visit http://healthy.uncg.edu. The average public school teacher spends plenty of their own money on school supplies for the classroom. The UNCG Staff Senate partners annually with the the Guilford Education Alliance Teacher Supply Warehouse, which offers new and gently-used school supplies to Guilford County Schools educators at no cost. Shelves are kept stocked through monetary donations, individual supply donations, and supply drives. Every donation made directly helps a Guilford County Schools educator.